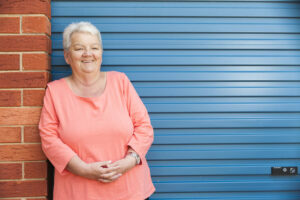 Kym has been living in her Women’s Property Initiative (WPI) home for 10 years, since the property was built. She lives with her daughter Hayley, who is a single mum, and her granddaughter Rosie who is 13. I divorced Hayley’s father when she was a teenager. It was a violent marriage. I bought a house in Geelong and thought, well at least we will always have this. But I was stupid and got mixed up with the wrong guy. He completely sucked me in and I ended up losing the house and spent two years in jail. It was humiliating and degrading. All the people that said they would be there for Hayley weren’t. She ended up pregnant and living in a refuge while I was in there. It was just lucky that I made a really good friend through the women’s prison network who helped her find a place to rent after the refuge. She was with Hayley when my granddaughter Rosie was born and now she’s her godmother. Then, when Hayley was eight months pregnant, her landlord decided to sell the flat she was in and she had to move out. She moved to another flat and the same thing happened again when Rosie was a tiny baby. When I was released from prison it was like ‘here’s some money and off you go’. It was like a different world. You’re not prepared for that. I moved in with Hayley, and Rosie was just a baby. We lived in a tiny flat which was way too small. Then we moved into a house – the only thing we could find that we could afford. It was alright at first, but then the cold came. All the doors and walls had gaps and we had a heater in one room. It was so cold and Rosie was always sick. We were there for a year. If you asked for something to be done, they refused. It was such a battle to stay healthy and function. You can’t do anything if you haven’t got a decent roof over your head. When I came out I had a lot of problems. In prison you are just a number. You only do what you are told. You get out of the habit of doing all the regular things and I was only 47. I don’t like asking for help. For me to come out and ask for help to start over wasn’t easy. When I asked for rent assistance their attitude was ‘’well you can have this but that’s it’’. Melbourne City Mission told me about a program for women who had exited prison, and through them WPI offered me one of the homes they were building. We drove up every day to look at it being built. We got the keys the day after they finished and we moved our stuff in that afternoon. When we got the chance to come here it was like “yes!” Rosie is as happy as, as healthy as. I’m happy. I’ve got control now. This is my safe area, my kids are here, we all feel safe. We look after it and I never want to move. We got robbed here so that set me off a bit, but WPI was really good. They put in an alarm for me, and we got the security doors. If WPI didn’t give us this place we couldn’t have afforded to rent anything like it. These sort of homes have to be here. It’s not just the women you are helping – it’s the kids, and the grandkids. Hayley has turned her life around as well, stayed out of trouble and raised her daughter. Rosie is doing really well at school and thankfully she has no idea what it is like to get a hiding the way Hayley and I did. This house is like a new start and a new life. It’s as good as owning your own house. People don’t realise what this does for your future. I am in control of my life. If I want something I can save for it. It’s the best thing. With thanks to Kym and the Women’s Property Initiative.